Size: 30 " w x 35 " h.
When Bill Phillips painted The Giant Begins to Stir, he embarked on an artist’s journey that grew to become a visual history of the United States’ response to the Japanese bombing of Pearl Harbor: Lieutenant Colonel Jimmy Doolittle’s air raid on Japan launched, for the first time ever, from the sea. The Greenwich Workshop limited edition of The Giant Begins to Stir (co-signed by surviving Doolittle Raiders) was followed by I Could Never Be So Lucky Again (co-signed by Jimmy Doolittle) and Evasive Action at Sagami Bay, (co-signed by surviving Doolittle Raiders.) The final painting in this series is Westbound: A Date with the General, illustrates the dramatic flight of Lt. Smith’s Crew #15. 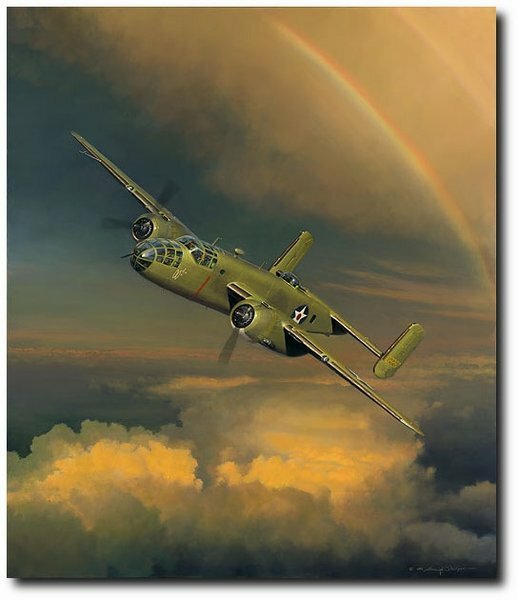 The limited edition print and canvas will be signed by Doolittle Raiders survivors. In an interesting aside, Bill Phillips’ father, a character actor in Los Angeles in the 1940s and ’50s, played a pilot in the film 30 Seconds Over Tokyo, as well as in Dive Bomber, and as Sergeant Kirby in A Yank in Korea.